Entry requirements: A bachelor degree with a 2:1 (hons) in a relevant subject. In recent years the study of plant sciences has been revolutionised by the development of new tools and technologies which have allowed unprecedented progress in the study of plant biology – knowledge which is being applied to develop sustainable solutions to some of the major challenges of the 21st century. This course will give you specialist training in the modern molecular aspects of plant science. A large part of your teaching will be delivered by academics from the University’s Centre for Plant Sciences (CPS) linked to the latest research in their areas of expertise. You’ll explore the wide ranges of approaches used in biomolecular sciences as applied to plant science. This will cover theory and practice of recombinant DNA and protein production, bioimaging using our confocal microscope suite, practical bioinformatics and theories behind ‘omic technologies. You’ll also learn how to design a programme of research and write a research proposal, read and critically analyse scientific papers in plant science and biotechnology and present the findings. A highlight of the course is your individual 80 credit practical research project. The course is 100% coursework assessed (although some modules have small in course tests). Our teaching and assessment methods are designed to develop your independent thinking, problem solving, communication skills and practical ability, making you attractive to employers or providing an excellent foundation for further study (eg PhD). You’ll study in a faculty ranked 6th in the UK for its research impact in the recent Research Excellence Framework (REF 2014). You’ll study in a stimulating environment which houses extensive facilities developed to support and enhance our faculty’s pioneering research. As well as Faculty operated facilities, the CPS laboratories are well equipped for general plant research. There is also a plant growth unit, including tissue culture suites with culture rooms, growth rooms and flow cabinets alongside transgenic glass-houses to meet a range of growth requirements. On this course you’ll gain an overview of a range of modern techniques and methodologies that underpin contemporary biomolecular plant sciences. You’ll also apply your knowledge to an extended practical investigation in the form of a laboratory-based mini project, involving practical training in a range of modern molecular biology and protein engineering techniques such as gene cloning, PCR, mutagenesis, protein expression, protein purification and analysis. A module on plant biotechnology will address current topics such as the engineering of plants, development of stress-tolerant crop varieties and techniques for gene expression and gene silencing through reading discussion and critical analysis of recent research papers. You’ll learn from the research of international experts in DNA recombination and repair mechanisms and their importance for transgene integration and biotechnological applications; plant nutrition and intracellular communication; and the biosynthesis, structure and function of plant cell walls. You’ll also explore the wide range of approaches used in bio-imaging and their relative advantages and disadvantages for analysing protein and cellular function. Bioinformatics and high throughput omic technologies are crucial to plant science research and you will take modules introducing you to these disciplines. In the final part of the course you'll work on an independent laboratory-based research project related to your course options. You’ll receive extensive training in experimental design, the practical use of advanced techniques and technologies, data analysis and interpretation, and will be assigned a research project supervisor who will support and guide you through your project. Your learning will be heavily influenced by the University’s world-class research as well as our strong links with highly qualified professionals from industry, non-governmental organisations and charities. You’ll experience a wide range of teaching methods including formal lectures, interactive workshops, problem-solving, practical classes and demonstrations. Through your research project and specialist plant science modules, you’ll receive substantial subject-specific training. Our teaching and assessment methods are designed to develop you into a scientist who is able to think independently, solve problems, communicate effectively and demonstrate a high level of practical ability. We use a variety of assessment methods: multiple-choice testing, practical work, data handling and problem solving exercises, group work, discussion groups (face-to-face and online), computer-based simulation, literature reviews, research paper critiques, posters and oral presentations. A bachelor degree with 2:1 (hons) in a subject that has covered the cellular and molecular basis of life such as: Genetics, Microbiology, Biochemistry. This pre-sessional course is designed with a progression route to your degree programme and you’ll learn academic English in the context of your subject area. To find out more, read Language for Science (6 weeks) and Language for Science: General Science (10 weeks). Provide a brief synopsis of any courses/modules you have studies that have covered the cellular and molecular basis of life. Please make reference to your academic transcript, as this information is not always apparent from the course titles. Provide details of any previous or current research experience (e.g. undergraduate project, vacation placements, fieldwork, internships). Describe clearly the aim of the work, your part in it, how long the project lasted and whether this research was carried out individually or in a group. Also mention specific techniques you have used. Again, please ensure that you make reference to the cellular and molecular aspects. Outline the reasons why you wish to study this particular Masters programme. Explain how the skills and experiences you have outlined above are relevant to your programme of choice and the career you intend to pursue. if we make you an offer, you respond by accepting, declining or deferring. We award a generous range of scholarships to UK, EU and international students. We consider all eligible applicants who demonstrate outstanding academic achievement and excellent personal and professional skills. Visit our FBS fees and scholarship page to find out more about the range of scholarships we have to offer. 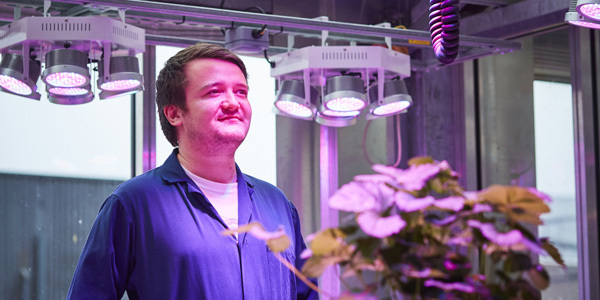 The strong research element of the Plant Science and Biotechmology MSc, along with the specialist and generic skills you develop, mean you’ll graduate equipped for a wide range of careers. Our graduates work in a diverse range of areas, ranging from bioscience-related research through to scientific publication, teacher training, health and safety and pharmaceutical market research. We have a proactive Industrial Advisory Board who advise us on what they look for in graduates and on employability-related skills within our courses. Some of our partners offer MSc research projects in their organisations, allowing students to develop their commercial awareness and build their network of contacts. We take personal and career development very seriously. We have a proactive Industrial Advisory Board who advises us on what they look for in graduates and on employability related skills within our courses. You will also have access to seminars and presentations from industry professionals (including our alumni) at faculty led career events. We also have regular research seminars presented by leading academics from around the world on their specialist subjects. Biopharmaceutical Experimental Officer, Covance, UK. Research post at Harvard School of Public Health, Botswana.